Target 1 Zombie-Type monster you control with 2000 or less ATK; it can attack your opponent directly this turn. This card references the vampiric power of mesmerism. 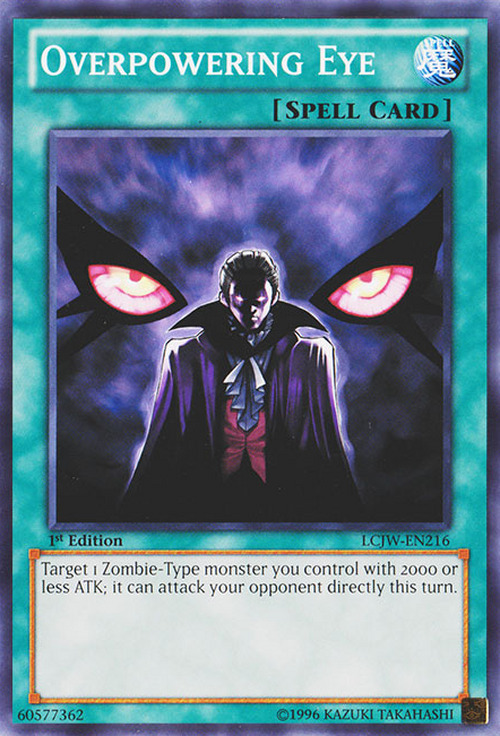 If the Zombie-Type monster’s ATK increases above 2000 after this card is activated, this effect will still apply. You cannot activate "Overpowering Eye" while "Ring of Magnetism" is on the field. This card cannot be activated during the Main Phase 1 of the first turn of the first player. This card cannot be activated during the Main Phase 2.